Darien Community Association’s art lecture series on sculpture concludes Oct. 25 with a talk by Joan Pachner on David Smith’s works. Presenter Joan Pachner, author of David Smith (1906 – 1965), will speak at 11 a.m., Thursday, Oct; 25 at the Darien Community Association (DCA). The lecture will begin promptly, and a luncheon will follow. 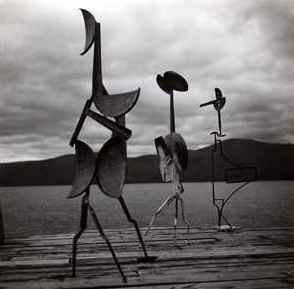 In 1933 David Smith altered the course of American sculpture by welding together pieces of metal, a process used on car assembly lines, not in artist studios. His inspiration was a photograph he had seen in a French magazine of a welded steel sculpture from 1928 by Pablo Picasso, which set the young artist on a course to ignore rules that had governed and inhibited sculptors for centuries. Characterized by a seemingly endless flow of formal inventions, Smith’s goal was never complete abstraction; he was continually inspired by the human figure, although he did dismantle and reimagine its form. He envisioned his work as a continuation of the flow of visual history reaching back to prehistoric times. This talk will focus on sculptures from each decade of Smith’s revolutionary career, each intended as an example of his challenging, often humorous, reinterpretation of the human figure. The luncheon is specially designed by Diane Browne Catering. Lecture only (without luncheon) is $25, or $20 for DCA members. Walk-ins welcome for lecture only, however, it is recommended that reservations and payment be made 24 hours in advance to assure a seat. The DCA’s 2018 Art Lecture Series sponsor is Laurel Road Bank.